Established in 2001, Kovai Doors (A Unit of A. 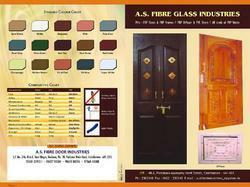 S Fibre Glass Industries) is most reputed Manufacturing and Supplier of Fiber Doors. We deliver unyielding quality of products, which include Fibre Doors, Fibre Bathroom Doors and UPVC Windows. We are widely appreciated and accepted in the market for the premium quality products. Our products are manufactured in well established infrastructure and advance machines and packed under sterile condition which is offered at very affordable prices. Our major feature that gives us an edge our competitors is the transparency in our dealing with our customers along with that we provide 24*7 assistance also. The reasons behind our success are the huge client base that we have gained because of our premium and consistent quality. We make sure that we gain a huge client base and that is done with the help of team of skilled professionals who are specifically trained to analyze and manufacture highly effective products and have knowledge of this domain. Our products are designed keeping in mind the latest trends so that we can meet the expectations of our clients. We have been working under the guidance of Mr.K.Jailani. He has functioned as mentor for the entire organization .His knowledge and experience has helped our company to become the market leaders. Manufacturing And Trading of Fiber Furnitures. We are one of a prominent manufacturers and suppliers of a wide range of Fiber Furniture, which is widely used for domestic as well as commercial purposes. A. S. Fibre glass industries now extend its capability to manufacture all kind of doors like membrane, melamine, teak vineer doors and skin doors and direct sales showrooms opened in coimbatore and tirupur. Process going on in udumalpet. "Open your valuable rooms with our kovai doors". All of the above-mentioned team members are well versed with market advancements, and work in sync with each other, and also with clients in order to meet varied requirements. Apart from this, we conduct grooming sessions to keep them abreast of latest developments. Owing to their coordinated efforts, we have successfully processed orders of our clients within agreed time frame.